To Cite: Shariatirad S, Mahjoub A, Haqiqi A, Rezaei Hemami M, Tofighi B, et al. Buprenorphine Added on Brief Cognitive Behavioral Therapy for Treatment of Methamphetamine Use Disorder, Iran J Psychiatry Behav Sci. 2018 ; 12(2):e11529. doi: 10.5812/ijpbs.11529. Background: Methamphetamine (MA) use remains a major public health concern around the world. Recent findings suggest that buprenorphine may be helpful for cocaine use reduction. Moreover, animal studies described reduced dopamine peak effect following MA use, due to the administration of low dose buprenorphine. Objectives: This study examined the effectiveness of buprenorphine with brief cognitive behavioral therapy on MA use disorder. Methods: The study was conducted in an outpatient substance abuse treatment center in Qazvin, Iran. Nineteen MA users received buprenorphine for 24 weeks combined with brief cognitive behavioral therapy in an outpatient substance abuse treatment program, three times per week, as a before and after non - randomization study. Clinical outcomes included treatment retention, MA use, degree of MA dependency and craving, quality of life, cognitive abilities questionnaire, addiction severity and also adverse events. Data was analyzed by performing repeated measures analysis and the Friedman test for nonparametric variables. 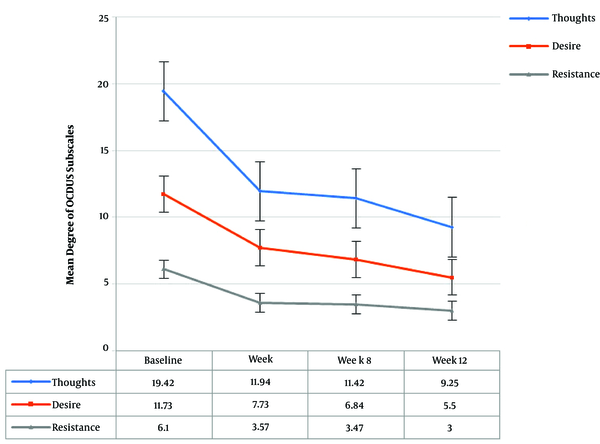 Results: Fifteen participants completed the study during six months and frequency of MA use was significantly decreased at 24 weeks (P < 0.001). There were also significant reductions in craving (P < 0.001), degree of MA dependence (P < 0.001), and improvements in quality of life, cognitive ability, and some subscales of addiction severity. Conclusions: The results of this preliminary clinical study demonstrated that buprenorphine could potentially attenuate MA craving and alternate rewarding effects of MA and had promising effects on cognitive impairment. Furthermore, buprenorphine can be considered as a harm reduction intervention in some communities, in which the people, as a result of cultural beliefs, do not accept a therapy, which only consists of counseling and no medications. Methamphetamine (MA) use remains a major public health burden globally. It is estimated that approximately 52 million individuals aged 15 to 64 years old, worldwide, have used amphetamine - type stimulants, such as ecstasy, amphetamine, and MA. However, although the use of ecstasy has remained stable in the recent years, the use of MA has increased by approximately 85% (1). Furthermore, MA use not only increases the risk for high risk sexual behaviors, yet it also reduces the effectiveness of Methadone Maintenance Treatment (MMT) (2, 3); it has been estimated that 20% to 60% of MMT patients in Iran use MA (4, 5). Methamphetamine use is accompanied by both structural and functional changes in the brain that lead to impairment in executive function (6). Cognitive squeal following MA use may also reduce the efficacy of psychological interventions, such as the Matrix model (7). Moreover, MA use is also associated with high levels of craving and rates of relapse. Numerous studies have been performed evaluating the impact of different medications in reducing MA craving. Bupropion and naltrexone have demonstrated some promising findings in reducing cravings for amphetamine in randomized controlled trials (8, 9). However, there is no approved and effective medication that contributes to long - term abstinence for recovery from MA use disorders. Recent animal studies have demonstrated encouraging findings of buprenorphine in attenuating the effect of MA; a study done on adult rats injected with subcutaneous buprenorphine revealed shortened periods of dopamine release and reduced MA - induced dopamine peak - effects (10). Furthermore, buprenorphine - exposed rats were found to have significantly reduced MA - related behaviors and cocaine self - administration (11, 12). Moreover, a randomized clinical study in Iran, which was held between participants, who were enrolled in Matrix therapy program, described significantly reduced cravings to MA use among participants that received buprenorphine compared with the placebo (13). Preliminary evidence suggests that buprenorphine may offer a novel approach for the treatment of MA use disorder. This research was an observational study to investigate the efficacy of buprenorphine treatment in MA users. This study aimed at assessing the effectiveness of buprenorphine with brief cognitive behavioral therapy for the treatment of MA use disorder among MA users in the city of Qazvin, Iran. The study was designed as a before and after non - randomization study in an outpatient substance abuse treatment center in Qazvin. Ethical approval was obtained from Tehran University of Medical Sciences Research Ethics Committee (ethical approval code: 130/322/93/S) and registered at the Iranian Registry of Clinical Trials (IRCT). Nineteen participants were recruited from an outpatient substance abuse treatment program in Qazvin, between July 2014 and June 2015, and provided an informed consent. Inclusion criteria included diagnosis of MA dependency, according to the Diagnostic and Statistical Manual of Mental Disorders four edition (DSM IV) criteria, age of 18 to 55 years old, and ability to read and write in Persian. Participants were excluded if they were enrolled in MMT, self - reported or tested positive for opiates, opioid, crack - heroin, and cannabis on a rapid urine test, reported any major medical or psychiatric disorders, if they were pregnant or not willing to use contraception during the study trial period, had inability to adhere to scheduled follow - up visits, or had any history of adverse reactions to buprenorphine. Among the initial 28 patients that underwent formal screening, seven (25%) were ineligible to enter the study due to enrollment in MMT (N = 4) and inability to adhere to scheduled follow - up visits (N = 3) (see Figure 1). The Cognitive Abilities Questionnaire (CAQ) consists of 30 items rated on a five - point Likert scale in Persian, to evaluate seven cognitive domains, including memory, inhibitory control and selective attention, decision making, planning, sustained attention, social cognition, and cognitive flexibility. The internal consistency (Cronbach’s alpha) was 0.834 and test - retest reliability was at P < 0.01 (14). The Leeds Dependence Questionnaire (LDQ) consists of 10 items rated on a four - point Likert scale evaluating dependency upon a variety of substances and is sensitive through the range from mild to severe dependence. The LDQ has a good level of internal consistency (Cronbach’s alpha = 0.94) and test-retest reliability (r = 0.95). However, no specific cut - off score has been established to indicate dependence (15). The Persian - validated version of Obsessive Compulsive Drug Use Scale (OCDUS) is a self - completed questionnaire, which assesses periodic craving upon substances, such as cocaine and heroin and measures three components of drug thoughts, desire to use drug, and resistance against thoughts and decisions to use drugs, and each question contains of five grade options, which are responded according to the participant’s experiences during the previous week (16). The Lite version of Addiction Severity Index (ASI - Lite) is a semi - structured questionnaire and consists of medical, employment/support, drug and alcohol use, legal, family/social, and psychiatric condition. The ASI - Lite measures problematic behaviors during the individual’s lifetime, as well as the previous 30 days (17). The Persian - validated version of World Health Organisation Quality of Life - BREF (WHOQOL - BREF) is a 26 - item questionnaire, which consists of four subscales including physical health, psychological health, social relationships, and environment. Each item contains five - grade options, which focus on the clients’ perceptions of their well - being during the previous two weeks. The internal consistency (Cronbach’s alpha) is 0.75 to 0.91 for all subscales (18). The primary outcome was assessment of MA use during the six - month study period. This was measured by rapid urinary tests, three times a week in the first three months, and weekly during the second half of the study period. Secondary outcomes included treatment retention, which was calculated by the number of individuals, who successfully finished the six - month treatment period, and cognitive abilities, addiction severity, quality of life, MA dependency, and craving. In addition, adverse events associated with buprenorphine were elicited during participant’s follow - up visits with the study physician. Data were presented as mean ± SD and frequency (%) for quantitative and qualitative variables. Repeated measures analysis was used to further evaluate for the trend of changes within the group. Friedman test was used for nonparametric variables. The Friedman test is used for one - way repeated measures analysis of variance by ranks. The SPSS (version 19) software was used for data analysis. P values of < 0.05 were considered significant. Baseline assessments were administered by a trained study physician and included the CAQ, LDQ, OCDUS, ASI - Lite, and WHOQOL - BREF. Participants were monitored daily for one week when they underwent medical and psychiatric screening, including liver function tests to evaluate potential liver disease. After enrollment, participants were inducted with buprenorphine, starting with a dose of 0.5 mg daily to reduce the risk of precipitated withdrawal and other adverse events. Buprenorphine dosage was increased during daily/weekly clinic visits until stabilization of MA cravings at the maximum dose of 8 mg daily. During this period, participants, who were unable to tolerate induction with buprenorphine were excluded from the study (N = 2) and were given instructions to follow - up with other addiction treatment services. Following stabilization, participants continued maintenance treatment for six months. During the first three months, participants were evaluated three times per week and rapid urine tests were conducted for benzodiazepine, opioids, and MA. During months four to six, follow - up intervals were limited to weekly visits. Participants were also provided with brief cognitive behavioral therapy (19) during weekly appointments by a trained Psychologist. All questionnaires, except ASI - Lite, were rechecked on the fourth, eighth and twelfth week visits. Moreover, cognitive abilities were rechecked on the 24th week visits. The ASI - Lite were checked only on baseline and 12th week visits. 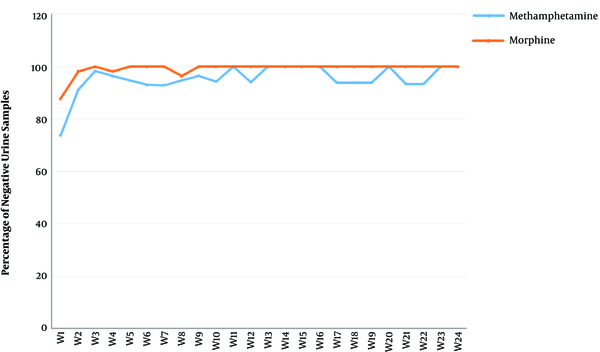 At the sixth month follow up visits, buprenorphine dosages were tapered over several weeks based on the Iranian protocol for buprenorphine treatment. However, participants were given the option to continue treatment with buprenorphine maintenance therapy with an addiction treatment program. The majority of participants (84.2%) were male and married (68.4%), with a mean age of 32.36 years (SD + 7.58). The mean duration of MA use was 35.73 months (SD + 27.34) with a mean dose of 1.00 grams daily (SD + 1.10). Most participants had a history of opioid use (89.5%), including opium and heroin, yet none received buprenorphine in the past for the treatment of opioid use disorder. Nearly half of the participants reported having been prescribed pharmacotherapy for MA (47.4%), including bupropion, sertraline, and sodium valproate (see Table 1). The duration of treatment and follow up in the current study was six months (175 days). According to Figure 1, two participants were excluded from the study because of adverse medication - related events, including nausea and vomiting. Fifteen participants (78.94%) remained in the treatment at six months. Table 1. Baseline Socio - Demographic Characteristics of Recruited Subjects (N = 19). Repeated measures analysis demonstrated statistically significant reductions in all domains of OCDUS during the study period (see Figure 2). In addition, MA dependency revealed statistically significant reductions in the degree of MA dependence throughout the study (P < 0.01). There was a significant reduction in rates of MA and opioid-positive urine drug screens (see Figure 3). Importantly, relapses to MA was not significant (P < 0.771) based on the Friedman test, thus the post hoc analysis was not applicable in this case. Following the study, addiction severity showed significant reductions in drug, family, and psychiatric status subscales (see Table 2). Also, quality of life had significant improvements in all subscales of the WHOQOL - BREF (see Table 2). Repeated measures analysis showed significant improvements in five cognitive domains, including memory, inhibitory control and selective attention, decision making, planning, sustained attention, and also in the total score. The changes in social cognition, cognitive flexibility and the total number were not significant (see Table 2). aDenotes a statistically significant difference. Moreover, only five mild adverse events were recorded during the study, all of which improved after 48 hours. These adverse events included nausea, dizziness, hiccups, itching and headache and are presented in Table 3. The principal finding on the treatment of MA use disorder in this study was a reduction in MA use, high retention in treatment, improvement in the addiction severity index, and quality of life during the study. Moreover, it seems buprenorphine’s attenuating effect on MA craving and improved cognitive functioning were also positive findings. Buprenorphine is a partial mu opioid receptor agonist and a Kappa Opioid Receptor (KOR) antagonist. Lab studies suggest that mu opioid receptor agonist activity with buprenorphine could result in lower MA consumption (20, 21). Moreover, KOR activation leads to dysphoria and also provokes stress - induced drug craving (22), thus it seems that buprenorphine could diminish drug craving by antagonistic effects on KOR. In addition, buprenorphine is also a partial agonist of nociceptin/orphanin FQ (N/OFQ) receptors (10), which has been found to block the rewarding effects of cocaine by reducing dopamine release (23). Lastly, buprenorphine attenuates MA - induced dopamine peak effect and it imposes a ceiling effect on dopamine release following MA use (10). This study also described statistically significant changes in several subscales of ASI - Lite. These include drug, family, and psychiatric subscales. In addition, significant changes were observed in all subscales of WHOQOL - BREF, including physical health, psychological health, social relationship, and environmental health. These significant changes in both quality of life and addiction severity were similar to the results described in a multi-site clinical trial, which assessed Opioid Substitution Treatment (OST) in 13 treatment programs in seven low and middle income countries (24). The quality of life and addiction severity scales are important findings that are associated with improved retention (25). It is known that MA use is associated with impaired cognitive functioning. According to these results, memory, inhibitory control and selective attention, decision making, planning, sustained attention, and cognitive flexibility improved following the study. Prior studies have described reduced cognitive deficits among patients receiving buprenorphine compared to methadone (26) and improvement of working memory. These findings may be attributed to the KOR antagonistic effects of buprenorphine on prefrontal dopamine tone (27). This study was similar to a prior trial by Salehi et al. that assessed the impact of buprenorphine on MA cravings (13). Although both studies showed attenuation of MA craving, there were some differences. Salehi et al. dispensed to maximum dose of buprenorphine (6 mg daily) compared to this study (1 mg daily), in which doses were adjusted based on participants’ self - reported MA cravings. This study also administered additional survey instruments, including ASI - Lite, WHOQOL - BREF, LDQ, OCDUS, and CAQ. These additional findings are critical in assessing factors that may influence retention in treatment and abstinence. Moreover, Salehi et al. combined matrix therapy with buprenorphine, while the current study replaced the matrix model with brief cognitive behavioral therapy. Brief cognitive behavioral therapy was integrated to buprenorphine treatment, because of lower expenses and greater feasibility. There are several limitations for the use of buprenorphine treatment for MA use disorder: First of all, this clinical study was a non - randomized, non - blinded, small sample sized observational study that did not use intention to treat analysis. In addition, these findings may not be generalizable to other clinical populations since this research only studied Iranian participants. Secondly, participants were closely monitored three times weekly during weekly visits, which many clinical settings may not be able to offer. This study also provided brief cognitive behavioral therapy yet was unable to isolate the impact of buprenorphine without its associated brief cognitive behavioral therapy. In addition, participants were followed for six months and this short study period may be insufficient to demonstrate the long - term clinical impact. In addition, the partial - mu receptor activity of buprenorphine will lead to opioid dependence in MA users. A method to minimize opioid dependence among MA users may be to attenuate the mu action of buprenorphine by co - administering a mu receptor antagonist, such as naltrexone (28). However, some studies showed that naltrexone has poor compliance and retention rate among opioid users (29, 30) and it seems this low adherence to naltrexone among opioid users, is due to depressive symptoms and dysphoria (31). Despite recent studies, which showed that depression can not be considered as a common adverse effect of naltrexone (32), yet naltrexone still had a lesser retention rate compared to other medical treatments, such as buprenorphine/naloxone, in Iran (33). Moreover, besides the successful preclinical studies of combination of buprenorphine and naltrexone on self - administration of cocaine without inducing physical dependence in rats (28), the correct ratio of buprenorphine and naltrexone for acceptable clinical response in humans is unknown. Nonetheless, buprenorphine shows promising effects on decreasing cocaine use among concomitant opiate and cocaine users (34). Moreover, buprenorphine plus naloxone in combination with naltrexone may be associated with reductions in cocaine use among cocaine users (35) and may be helpful in MA use disorder. Although clinical evidence supporting the treatment of pure MA users with buprenorphine are not sufficient, yet buprenorphine can be a suitable treatment for MA users, who co - use opiates. These preliminary results describe the safety and potential clinical impact of buprenorphine in attenuating MA craving, and also its promising effects on cognitive impairment in MA users. Furthermore, there are some observations from the key informant that buprenorphine can be regarded as a harm reduction intervention in some communities because it leads to a close relationship between the treatment team and the patient; this role is especially important in communities, in which people, as a result of cultural beliefs, do not accept a therapy, which only consists of counseling and no medications. The authors appreciate all the participants, who helped in the study. The authors would like to thank Dr. Ramin Radfar, Dr. Alireza Noroozi, and Dr. Elham Khalili for their guidance. The proposal approval number of this study was 92-03-167-24362, approved by the Tehran University of Medical Sciences, Tehran, Iran, 2014. Authors’ Contributions: Schwann Shariatirad, Mohsen Rezaei Hemami, Hamed Ekhtiari and Babak Tofighi designed the study and prepared the manuscript. Schwann Shariatirad, Ashraf Haqiqi, and Alireza Mahjoub conducted the study, including patient recruitment and monitoring and also data collection. Mohammad Effatpanah supervised the study and Mohsen Rezaei Hemami analyzed the data. Schwann Shariatirad contributed to writing the proposal and the paper. All authors contributed to reading and editing, and approved the final draft of the paper. Funding/Support: Financial supports of this study had been provided by both Tehran University of Medical Sciences and Faran Shimi Company. Financial Disclosure: All authors had no financial relationships with any organizations that might have an interest in the submitted work in the previous three years; there were no other relationships or activities that could appear to have influenced the submitted work. 1. United Nations Office on Drugs and Crime. World Drug Report 2015. New York, USA: United Nations publication; 2015. 10 p.
2. Radfar SR, Cousins SJ, Shariatirad S, Noroozi A, Rawson RA. Methamphetamine Use Among Patients Undergoing Methadone Maintenance Treatment in Iran; a Threat for Harm Reduction and Treatment Strategies: A Qualitative Study. Int J High Risk Behav Addiction. 2016;5(4). doi: 10.5812/ijhrba.30327. 3. Shariatirad S, Maarefvand M, Ekhtiari H. Methamphetamine use and methadone maintenance treatment: an emerging problem in the drug addiction treatment network in Iran. Int J Drug Policy. 2013;24(6):e115-6. doi: 10.1016/j.drugpo.2013.05.003. [PubMed: 23773684]. 4. Alam-Mehrjerdi Z, Abdollahi M. The Persian methamphetamine use in methadone treatment in Iran: implication for prevention and treatment in an upper-middle income country. Daru. 2015;23:51. doi: 10.1186/s40199-015-0134-5. [PubMed: 26578071]. [PubMed Central: PMC4650324]. 5. Alam-mehrjerdi Z, Mokri A, Dolan K. Methamphetamine use and treatment in Iran: A systematic review from the most populated Persian Gulf country. Asian J Psychiatr. 2015;16:17-25. doi: 10.1016/j.ajp.2015.05.036. [PubMed: 26123235]. 6. Halpin LE, Collins SA, Yamamoto BK. Neurotoxicity of methamphetamine and 3,4-methylenedioxymethamphetamine. Life Sci. 2014;97(1):37-44. doi: 10.1016/j.lfs.2013.07.014. [PubMed: 23892199]. [PubMed Central: PMC3870191]. 7. Meredith CW, Jaffe C, Ang-Lee K, Saxon AJ. Implications of chronic methamphetamine use: a literature review. Harv Rev Psychiatry. 2005;13(3):141-54. doi: 10.1080/10673220591003605. [PubMed: 16020027]. 8. Brensilver M, Heinzerling KG, Swanson AN, Shoptaw SJ. 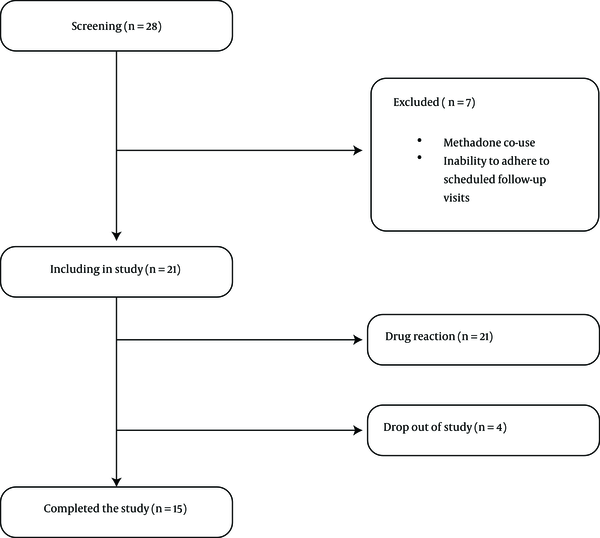 A retrospective analysis of two randomized trials of bupropion for methamphetamine dependence: suggested guidelines for treatment discontinuation/augmentation. Drug Alcohol Depend. 2012;125(1-2):169-72. doi: 10.1016/j.drugalcdep.2012.03.027. [PubMed: 22534658]. [PubMed Central: PMC3418457]. 9. Jayaram-Lindstrom N, Hammarberg A, Beck O, Franck J. Naltrexone for the treatment of amphetamine dependence: a randomized, placebo-controlled trial. Am J Psychiatry. 2008;165(11):1442-8. doi: 10.1176/appi.ajp.2008.08020304. [PubMed: 18765480]. 10. Pereira FC, Gough B, Macedo TR, Ribeiro CF, Ali SF, Binienda ZK. Buprenorphine modulates methamphetamine-induced dopamine dynamics in the rat caudate nucleus. Neurotox Res. 2011;19(1):94-101. doi: 10.1007/s12640-009-9143-9. [PubMed: 20033362]. 11. Mori T, Ito S, Kita T, Narita M, Suzuki T, Sawaguchi T. Effects of mu-, delta- and kappa-opioid receptor agonists on methamphetamine-induced self-injurious behavior in mice. Eur J Pharmacol. 2006;532(1-2):81-7. doi: 10.1016/j.ejphar.2005.12.035. [PubMed: 16464448]. 12. Mello NK, Lukas SE, Kamien JB, Mendelson JH, Drieze J, Cone EJ. The effects of chronic buprenorphine treatment on cocaine and food self-administration by rhesus monkeys. J Pharmacol Exp Ther. 1992;260(3):1185-93. [PubMed: 1545386]. 13. Salehi M, Emadossadat A, Kheirabadi GR, Maracy MR, Sharbafchi MR. The Effect of Buprenorphine on Methamphetamine Cravings. J Clin Psychopharmacol. 2015;35(6):724-7. doi: 10.1097/JCP.0000000000000408. [PubMed: 26468683]. 14. Nejati V. [Cognitive Abilities Questionnaire: Development and Evaluation of Psychometric Properties]. Adv Cognit Sci. 2013;15(2):11-9. Persian. 15. Raistrick D, Bradshaw J, Tober G, Weiner J, Allison J, Healey C. Development of the Leeds Dependence Questionnaire (LDQ): a questionnaire to measure alcohol and opiate dependence in the context of a treatment evaluation package. Addiction. 1994;89(5):563-72. [PubMed: 8044122]. 16. Hassani-Abharian P, Mokri A, Ganjgahi H, Oghabian MA, Ekhtiari H. Validation for Persian Versions of "Desire for Drug Questionnaire" and "Obsessive Compulsive Drug Use Scale" in Heroin Dependents. Arch Iran Med. 2016;19(9):659-65. [PubMed: 27631182]. 17. Cacciola JS, Alterman AI, McLellan AT, Lin YT, Lynch KG. Initial evidence for the reliability and validity of a "Lite" version of the Addiction Severity Index. Drug Alcohol Depend. 2007;87(2-3):297-302. doi: 10.1016/j.drugalcdep.2006.09.002. [PubMed: 17045423]. 18. Karimlou M, Salehi M, Zayeri F, Massah Choolabi O, Hatami A, Moosavy Khatat M. [Developing the Persian Version of the World Health Organization Quality of Life-100 Questionnaire]. Journal of Rehabilitation. 2011;4(11):73-82. Persian. 19. Baker A, Lee NK, Claire M, Lewin TJ, Grant T, Pohlman S, et al. Brief cognitive behavioural interventions for regular amphetamine users: a step in the right direction. Addiction. 2005;100(3):367-78. doi: 10.1111/j.1360-0443.2005.01002.x. [PubMed: 15733250]. 20. Eastwood EC, Phillips TJ. Morphine intake and the effects of naltrexone and buprenorphine on the acquisition of methamphetamine intake. Genes Brain Behav. 2014;13(2):226-35. doi: 10.1111/gbb.12100. [PubMed: 24152140]. [PubMed Central: PMC3976242]. 21. Eastwood EC, Phillips TJ. Opioid sensitivity in mice selectively bred to consume or not consume methamphetamine. Addict Biol. 2014;19(3):370-9. doi: 10.1111/adb.12003. [PubMed: 23145527]. [PubMed Central: PMC3796126]. 22. Xu K, Seo D, Hodgkinson C, Hu Y, Goldman D, Sinha R. A variant on the kappa opioid receptor gene (OPRK1) is associated with stress response and related drug craving, limbic brain activation and cocaine relapse risk. Transl Psychiatry. 2013;3. e292. doi: 10.1038/tp.2013.62. [PubMed: 23962922]. [PubMed Central: PMC3756290]. 23. Sakoori K, Murphy NP. Central administration of nociceptin/orphanin FQ blocks the acquisition of conditioned place preference to morphine and cocaine, but not conditioned place aversion to naloxone in mice. Psychopharmacology (Berl). 2004;172(2):129-36. doi: 10.1007/s00213-003-1643-3. [PubMed: 14624329]. 24. Feelemyer JP, Jarlais DCD, Arasteh K, Phillips BW, Hagan H. Changes in quality of life (WHOQOL-BREF) and addiction severity index (ASI) among participants in opioid substitution treatment (OST) in low and middle income countries: an international systematic review. Drug Alcohol Depend. 2014;134:251-8. doi: 10.1016/j.drugalcdep.2013.10.011. [PubMed: 24200104]. [PubMed Central: PMC3880839]. 25. Casares-Lopez MJ, Gonzalez-Menendez A, Festinger DS, Fernandez-Garcia P, Fernandez-Hermida JR, Secades R, et al. Predictors of retention in a drug-free unit/substance abuse treatment in prison. Int J Law Psychiatry. 2013;36(3-4):264-72. doi: 10.1016/j.ijlp.2013.04.003. [PubMed: 23706657]. 26. Pirastu R, Fais R, Messina M, Bini V, Spiga S, Falconieri D, et al. Impaired decision-making in opiate-dependent subjects: effect of pharmacological therapies. Drug Alcohol Depend. 2006;83(2):163-8. doi: 10.1016/j.drugalcdep.2005.11.008. [PubMed: 16343811]. 27. Rapeli P, Fabritius C, Kalska H, Alho H. Cognitive functioning in opioid-dependent patients treated with buprenorphine, methadone, and other psychoactive medications: stability and correlates. BMC Clin Pharmacol. 2011;11:13. doi: 10.1186/1472-6904-11-13. [PubMed: 21854644]. [PubMed Central: PMC3176473]. 28. Wee S, Vendruscolo LF, Misra KK, Schlosburg JE, Koob GF. A combination of buprenorphine and naltrexone blocks compulsive cocaine intake in rodents without producing dependence. Sci Transl Med. 2012;4(146):146ra110. doi: 10.1126/scitranslmed.3003948. [PubMed: 22875830]. [PubMed Central: PMC3448552]. 29. Kirchmayer U, Davoli M, Verster AD, Amato L, Ferri A, Perucci CA. A systematic review on the efficacy of naltrexone maintenance treatment in opioid dependence. Addiction. 2002;97(10):1241-9. [PubMed: 12359026]. 30. Rothenberg JL, Sullivan MA, Church SH, Seracini A, Collins E, Kleber HD, et al. Behavioral naltrexone therapy: an integrated treatment for opiate dependence. J Subst Abuse Treat. 2002;23(4):351-60. [PubMed: 12495797]. 31. Hollister LE, Johnson K, Boukhabza D, Gillespie HK. Aversive effects of naltrexone in subjects not dependent on opiates. Drug Alcohol Depend. 1981;8(1):37-41. [PubMed: 7297411]. 32. Dean AJ, Saunders JB, Jones RT, Young RM, Connor JP, Lawford BR. Does naltrexone treatment lead to depression? Findings from a randomized controlled trial in subjects with opioid dependence. J Psychiatry Neurosci. 2006;31(1):38-45. [PubMed: 16496034]. [PubMed Central: PMC1325065]. 33. Mokri A, Chawarski MC, Taherinakhost H, Schottenfeld RS. Medical treatments for opioid use disorder in Iran: a randomized, double-blind placebo-controlled comparison of buprenorphine/naloxone and naltrexone maintenance treatment. Addiction. 2016;111(5):874-82. doi: 10.1111/add.13259. [PubMed: 26639678]. 34. Kosten TR, Rosen MI, Schottenfeld R, Ziedonis D. Buprenorphine for cocaine and opiate dependence. Psychopharmacol Bull. 1992;28(1):15-9. [PubMed: 1609037]. 35. Ling W, Hillhouse MP, Saxon AJ, Mooney LJ, Thomas CM, Ang A, et al. Buprenorphine + naloxone plus naltrexone for the treatment of cocaine dependence: the Cocaine Use Reduction with Buprenorphine (CURB) study. Addiction. 2016;111(8):1416-27. doi: 10.1111/add.13375. [PubMed: 26948856]. [PubMed Central: PMC4940267].